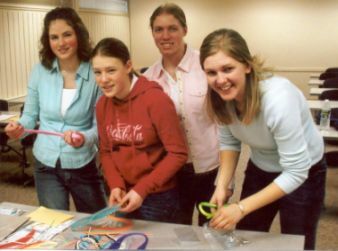 4H Leaders Can Be Young AND Qualified! Can Be Young and Qualified! Where can one find 4H Leaders for their club? For us, it was right under our noses! 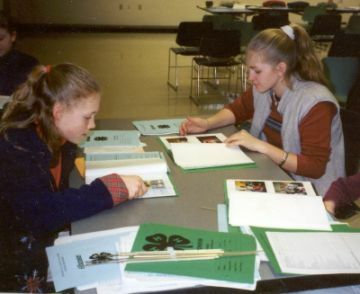 Our 4 H Club was just a few years old. Each year we homeschool moms wondered who would take over the General Leader position. None of us wanted to take it on, we were already busy homeschooling. Emily with friend Libbey teaching a Record Book Class. Little did we know that our teenage daughters were becoming quite eligible for the position by taking on leadership roles of their own! Laura & Annette teaching swing. 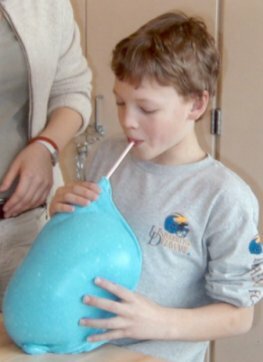 - Garrett blowing up his Slime Bubble. The girls taught these classes at Family Learning Day. As you can see, the classes were a huge success! 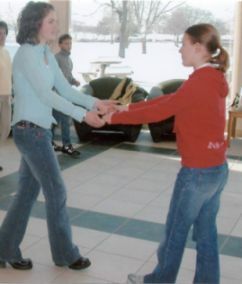 The girls became more and more confident the more classes they taught. Three of our oldest members had held leadership positions (president, treasurer, etc.) over the years. Each position came with its own unique set of responsibilities and character qualities. Combining their teaching experiences with offices held, each of these young ladies were (in their mother's opinion!) quite qualified to tackle the General Leader position. With the okay from our county youth development advisor, they became our Co-General Leaders! And how did they do, you ask? Very well! They were able to run the meetings without any help from us moms. We were all very proud of them, including the members. This experience has helped to mold them into the fine young adults that we expected them to be!